Talofa Samoa! In our previous Health column we mentioned that those of us, who eat a lot of meat, poultry, fish, milk, cheese or eggs, harbour certain bacteria in their gut that can lead to the production of cancer-causing substances. If you want to protect yourself from developing cancer, the message is simple: stick to the whole foods, plant based (WFPB) diet! In this column we want to emphasize further this point. In our Health Seminars we present the evidence collected more than 40 years ago by Professor Ken Carrol from Canada, who investigated the diets of people from around the world. He showed that there was a direct relationship between the amount of animal fat (derived from eating animal products – meat, dairy and eggs) people consumed and the incidence of breast cancer. The more animal products consumed, the higher the incidence of women dying from breast cancer. This information would later be reinforced with the findings of The China Study, a massive scientific research undertaken by Professor T. Colin Campbell of Cornell University (USA), and his colleagues of the Chinese Academy of Preventive Medicine and Oxford university that bluntly stated that ‘people who ate the most animal-based foods got the most chronic disease’, meaning all the non-communicable diseases (NCD) and cancer. In spite of this information, some of the participants at METI’s Health Seminars keep asking our view on the so-called ‘low carbohydrate, high (animal) protein’ diets –the more popular being the Atkins and more recently the PALEO diet- promoted for weight reduction and the resultant lowering of cholesterol. In his recent publication “The End of Heart Disease”, Dr. Joel Fuhrman comments that ‘what they can’t show is a reversal of (heart disease) after subjects follow a diet in which animal products are consumed excessively.’ People following such diets might boast about a temporary weight loss, but it will be at a cost that could end their lives prematurely. To enlighten the readers, let me dip once more in the ‘grab bag’ with the thousands of scientific articles that show that animal products promote NCD and cancer. A massive study published in 2012, involving 43,000 Swedish women that had been followed for more than 15 years, showed a 60% increased risk of cardiovascular events in those adhering to a low-carb, high-protein diet. The more the consumption of animal products increased, the higher the incidence of heart disease and dying from a heart attack. About ten years ago a study found that Uruguay, the country in South America, which is one of the top consumers of red meat, also has the sad reputation of being one with the highest cancer rates in the world. Chinese researchers have pointed out over the last 2 decades that the Mongols, another population that traditionally eats a lot of meat, were noted to develop a higher rate of heart disease compared with people in other parts of China. In 2014, a famous study tracking 6000 people in the 50 to 65 age range found that those consuming the highest amount of animal protein had a 75% increased risk of death and a fourfold increased risk of cancer. So, if you still want to embark on a low carbohydrate, high animal protein diet, be aware of the risks you are taking of ruining your health and shortening your life. Finally, a solid piece of good advice presented in the recently published 3rd Expert Report of the Continuous Update Project of the World Cancer Research Fund, collaborating with the American Institute for Cancer Research: “Eat a diet high in all types of plant foods including at least five portions or servings (at least 400 grams or 15 ounces in total) of a variety of non-starchy vegetables and fruit every day. We hope our readers will reflect on this simple advice and share it with their loved ones. We are happy to present here –in her own words- the testimony of another one of our ‘champions’, Lalotea Tulia’upupu , who has reversed her high blood pressure and heart failure by strictly following the WFPB diet. 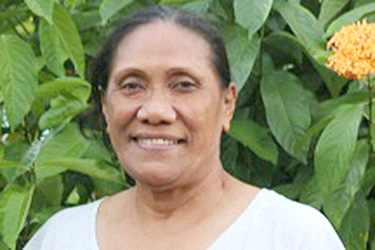 My name is Lalotea Tulia’upupu, sixty one year old, from Letogo. I had never known any sickness, until in 2008, one day I could hardly breathe and felt like having asthma. I got shortness of breath, couldn’t sleep lying down on the floor, but could only sleep sitting up straight. After two weeks suffering like this, my family took me to the hospital at Motootua. The doctor diagnosed me and gave pills because I got heart failure, I had hypertension. I also had a stomach ulcer, thyroid and liver problems. I started taking those pills from 2008 till 2017. Luckily I have a niece, who is a nurse in Pago, who took me to Fagaalu Hospital for checking, and then I moved to the USA for continuing my check-ups. I buy the book called “Thyroid Healing” from the best sellers’ list, and it helped me a lot by following some of their recipes. This year in June, I joined METI’s program called Whole Foods Plant Based Nutrition. This is a great “Gospel” that helped me reverse all my medical conditions. High blood pressure, heart failure and thyroid problems have all been reversed and I stopped all my pills. Let us remember the Hippocrates quote “Let thy food be thy medicine”. I just want to say thank you very much METI for this reversal diet that I’m back to normal and free from drugs. If you are suffering from any kind of Non Communicable Diseases, I encourage you, don’t wait but go and visit METI’s Clinic at Motootua. Soifua. *If you, reading this Health column or any of your family or friends are suffering from NCD, it might be wise to come to the METI Clinic at Motootua to enroll in our Health Seminars to get all the details of how to start the life-saving WFPB nutrition program. You can reach us at 7625528 or 7239297 during working hours, 8 am to 4 pm, Monday to Friday.